MISSION, KS--(Marketwired - Jun 13, 2013) - (Family Features) Millions of Americans are expected to take a summer vacation this year. If you're one of those hitting the road to reach your final destination, here are a few reminders to help ensure you're road-trip-ready. Even if you properly care for your vehicle year round by keeping up with regularly scheduled maintenance, it is wise to check your vehicle's oil, coolant and wiper fluid levels before heading out on the road. Hot summer temperatures can cause your engine to overheat, so keep an eye on all of the warning lights on your dashboard -- from the engine light to the gas gauge. To help avoid any unfortunate surprises, do a thorough check of your vehicle, paying special attention to the only part that actually touches the road -- your tires. Be sure to properly check all four tires with a tire pressure gauge. The optimum tire pressure required for your car can be found on a sticker in the door jamb, on the inside of the glove compartment door or in the owner's manual. "The proper inflation is essential for the performance and longevity of a tire," said Ron Margadonna of Michelin. "In fact, keeping your tire pressure at the recommended level can boost fuel efficiency by one mile per gallon." Unexpected storms are common during the summer months and the first few minutes of a rain shower can be a dangerous time for drivers. Oil and grease trapped on roadways rises to the surface and can create slippery driving conditions that can impact the traction and grip of your car. In fact, stopping on a wet road can take up to four times the normal distance as a dry road. It's best to slow down and increase the space between you and the vehicle in front of you. Remember to tell neighbors, friends and family that you'll be out of town. Ask your neighbors to keep an eye on the house and have someone pick up your mail and newspaper. It's also a good idea to set up timers on lamps and lights in various rooms throughout your home so it looks occupied. No matter how well you plan your journey, you can never predict what obstacles you might encounter along the way. Road construction, traffic detours or bad weather can be troublesome if you don't have a backup plan. 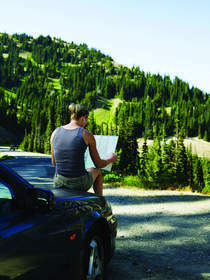 It's best to review your route and understand the alternate roads that can help you arrive at your destination safely, stress free and ready to enjoy your vacation. For tire maintenance tips and more information, visit www.MichelinMan.com.